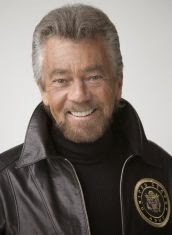 Last Thursday was a sad day for many with the announcement that writer/producer Stephen J. Cannell died at the age of 69 after battling melanoma. If you watched television in the ’80s and ’90s, then chances are you saw one or more of Cannell’s 42 shows like the The Rockford Files, The A-Team, 21 Jump Street and The Greatest American Hero. He eventually went on to start his own studio and within five years it was the third-largest supplier of television shows and employed 2,100 people. After selling his company, he changed his focus to writing novels. Most of his 16 novels went on to become best-sellers. Usually when I hear the news that a well-known author or celebrity has died, I take a moment and think, how sad, and then continue on my day. This was different. Just six months ago Stephen Cannell was the opening keynote for my Northern Colorado Writers Conference. I had the privilege of interviewing him a couple weeks before the event and then had a chance to meet him in person before he delivered his keynote. The more I learned about Stephen, the more impressed I became. His success did not come easy. He had severe dyslexia and yet, he made an incredible career from his writing. When I asked him how he did it, he said, "I’ve never been afraid of failure. I flunked the 1st grade, I flunked the 4th grade, I flunked the 10th grade. I have no illusions of being brilliant. So for me it is all about how good can I make it and how much fun can I have doing it." I think this is where so many of us writers fall short. We are so worried about the final product that we prevent ourselves from writing through the bad stuff in order to find those hidden gems. We want and expect our writing to be perfect from the start. Considering all the hurdles he had to go over, Stephen didn't let that stop him. Before he got his first break, he wrote every day for five hours a day in addition to his full-time job of delivering furniture. He did this for five years without selling a single thing! "Those were the hours," he said, "that at the time they didn’t appear to be very productive, but that qualified me so when I did finally find a hole in the wall and get through people read my stuff and said, ‘Wow, how do I get you to work for us?’"
Stephen was and still is a perfect example of how perseverance pays off and that in order to be a successful writer, you have to sit down and write. One of my NCW members Darlene Mueller Morse sent me her thoughts after she heard the news about Stephen. "Thanks for bringing him here (NCW conference). I know that there were many people there who already knew and loved him and his work. I'm sure that they will remember having this chance to meet him and to have him sign his book. Sometimes we forget that the writer is mortal but the written word is immortal." I remember reading your interview of Stephen Cannell here. I was sorry to hear of his death. Stephen Cannell was a personal hero of mine. He made no bones about it -- it was about the work. He also made sure every writer on his staff who wanted it got the opportunity to excel. Great boss, great speaker and a great man. Thanks for sharing about Stephen. I agree with Darlene--well said. Glad I got to see and hear him at the NCW conference. He sounds like he was a wonderful man. You were lucky to have had the opportunity to meet him. I loved his keynote at the NCW Conference. This is sad news. Prayers for his family. It seems likely that a writer with cancer would have written about it, perhaps in diary form. Does this material exist, and can we read it?